Burnam Monument Foundation, Inc./ Associated Press ) - This undated publicity photo provided by John Burnam Monument Foundation, Inc., shows the frontal view of the U.S. Military Working Dog Teams National Monument. It is the first national monument ever to pay tribute to dogs and honors every dog who has served in combat since World War II. LOS ANGELES — The act of Congress is in the books, the bills are paid, the sculptures are being cast, and one of the biggest parades in the world will start a glory tour and countdown to dedication. The first national monument to pay tribute to military dogs will be unveiled in California in just two months. The U.S. Working Dog Teams National Monument will honor every dog that has served in combat since World War II. Some cities, cemeteries and military bases across the country already have such memorials. But none has been elevated to national monument level, where it will be in the company of the Statue of Liberty, Yosemite National Park and Mount Rushmore National Memorial. In 2000, John Burnam, a 65-year-old veteran military dog handler, wrote a book called “Dog Tags of Courage.” A year later, he got an email from a reader wondering why there were no national monuments to the dogs of war. In “Dog Tags” and a 2008 book, “A Soldier’s Best Friend,” Burnam wrote about his time with the Army’s 44th Scout Dog Platoon when he was in Vietnam in 1967 and 1968. His first dog, Timber, was injured in an ambush a few months after they teamed up, so he spent most of his tour with a German shepherd named Clipper. “He saved my life and saved the lives of others by alerting on ambushes, snipers and booby traps. I wanted to give something back to these animals that have done so much and asked for so little, except for food and water and the love of their handlers,” said Burnam, who received the Legion of Merit, Bronze Star and Purple Heart. Back then, handlers were not able to adopt their dogs when they were retired. “I always worried about them but I know they died over there and they died as heroes,” he said. In 2004, Burnam and two other dog handler veterans pursued the idea in earnest, forming the John Burnam Monument Foundation Inc. But it took two more years, until he met Rep. Walter B. Jones, R-N.C., that the monument project started to take shape. In 2007, Jones introduced legislation authorizing establishment of the monument. Passed unanimously by Congress, it was signed the next year by President George W. Bush, then amended and signed by President Barack Obama. 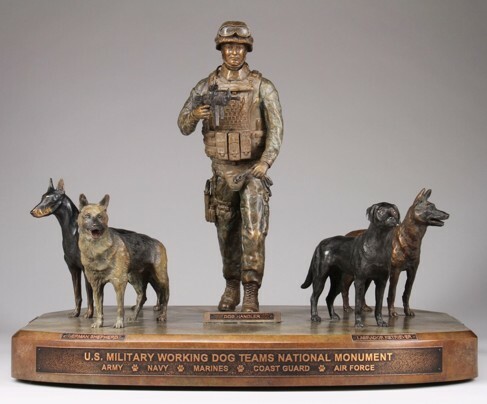 Burnam designed the monument, which depicts the modern military handler and four dogs — a Doberman, German shepherd, Labrador retriever and Belgian Malinois, all breeds used in wars. The figures will stand on a pedestal, in front of a large granite wall. One side of the wall will have photos etched in black marble veneer showing dog teams in combat from the different wars. The other side will have an inscription written by Burnam. The money for the monument came slowly. Burnam made one of many fundraising pitches on the reality TV show “Who Let the Dogs Out,” featuring Tillman, the skateboarding, surfing and snowboarding bulldog. The president of Natural Balance Pet Foods Inc., the company that Tillman represents, attended the show taping and volunteered to pitch in more than $1 million. “Don’t do a thing. Natural Balance and Petco (Animal Supplies Inc.) will take care of it,” Joey Herrick said. To raise funds for the monument and its maintenance, Natural Balance created a jerky bark treat sold by Petco. Maddie’s Fund, a family-funded pet rescue foundation, also signed on as a corporate sponsor. The public will get a sneak peak of the monument at the Tournament of Roses parade in Pasadena on Jan. 1, when a floral replica will be used as Natural Balance’s float. Burnam, dogs and handlers from every military service branch will ride on it. When the float goes on display afterward at Victory Park, the real bronze monument will make its public debut next to it, Herrick said. Then the bronze monument will go on tour as it heads to Lackland Air Force Base in San Antonio. The location was chosen as the site for the monument because that’s where most of the nation’s military’s dogs are trained. Meanwhile, Tillman, the dog that helped get Burnam the monument funding, is also getting personal recognition for his military service. For his work entertaining troops at bases and for going through a mini Marine boot camp, the athletic bulldog has been made an honorary private 1st class. Natures recipe dog food formula contains all the nutritional building blocks for your dog good health! This food is a special food designed for dogs that will give him correct nutrition.